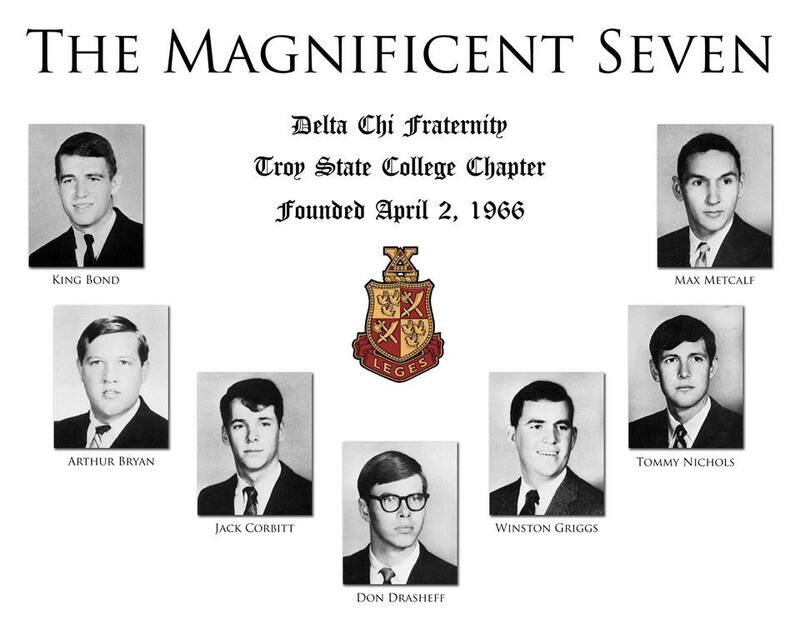 The Troy State Chapter was founded on April 2, 1966. We give credit to seven men, who are referred to as “The Mag Seven”. Those men are as follows: King Bond, Jr., Arthur Bryan, Jack Corbitt, Jr., Don Drasheff, Winston Griggs, Max Metcalf, and Tommy Nichols. Doctors, Actors, Commercial Pilots, Writers, Mayors, Circuit Judges, Accountants, Pharmacists, Bankers, Real Estate Developers, Attorneys, Artists, Musicians, and various Others. Some Specific Examples of successful alumni: CEO of Kelley Foods, Troy University Board of Trustee Members, PGA Golf Professional, Directors of the “Sound of the South”, Alabama house of Representatives, College and University Presidents, Professional Baseball Players–this is only the beginning of what our brothers have accomplished! Our alumni have always been heavily involved in the Armed Forces from the days of the Vietnam War to the current War on Terrorism. All branches of the armed forces have Delta Chi alumni from TROY. We have former F-16, B-52, and C-130 pilots, along with many serving in officer roles. We have retired Colonels form the United States Army, Drill Instructors from the Marine Corps, and a retired Captain from the United States Navy.